We have unfortunately had a spate of poisonings again these last few weeks. This is always very upsetting, as sometimes a whole family of dogs is affected and many will die before they can reach the vet. For organophosphate (Temic, two-step) poisoning, the antidote, if administered quickly, is very effective in controlling the worst of the symptoms, which cause death. These fatal symptoms are mainly breathing difficulties caused by central depression of the breathing stimulus in the brain, severe broncho-constriction and excessive bronchial mucus production. Additionally the heart rate also slows down severely. The antidote, atropine, is a dangerous drug and a ‘toxin’ in itself and can have very serious effects on animals or people where it is not medically required or in excessive doses. It can thus not be given to people to use at home if they suspect that their dog has been poisoned. Prevention is thus better than cure. Most poison is thrown over the wall in meat, so try to keep your dogs away from the street-facing section of your garden if possible, or even keep them indoors at night. However, the problem still remains that when they are let out into the yard again, they might find and eat anything thrown over during the night. Even if you do a perimeter check, it would be very difficult to guarantee that you would find everything. If you are in a high risk area maybe it would be an idea to take one of your “sniffers”, the greedy type dogs, and walk the perimeter on a short lead. These dogs would be sure to pull in the direction of any meat thrown over the fence. You can then check, collect and discard anything you find that shouldn’t be there. Improved networking systems – neighbourhood watch groups – in your neighbourhood can also allow pet owners to post early warnings as poisoners usually target whole neighbourhoods or streets at a time. 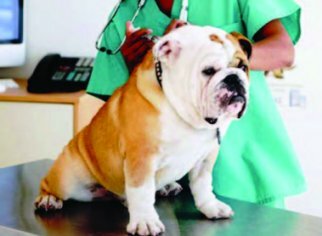 If you see the early signs of organophosphate poisoning – vomiting, stumbling about and salivation – it is vital to get to the nearest vet as soon as possible to get the antidote. Don’t waste precious time trying to get your dog to vomit. The symptoms already include vomiting, and if they are showing clinical signs of poisoning by now, it means that they have already absorbed the poison. Also be aware that even if only one dog is affected, the others may still be going to show clinical signs as they might have eaten less or might have found some meat later. So, take the most seriously affected dog to the vet immediately and someone else must bring the other dogs as well. Failing that, you must take the other dogs inside and lock them up before leaving the property. It is essential that the whole property is searched for any remaining poison before letting the dogs go outside again. Be warned: The criminals are waiting for you to be vulnerable – leaving the house, going to the vet – so, take security precautions. Know which practice is your closest vet. You need to also know where the closest available vet is afterhours because most poisoning occurs at night. Getting your dog to vomit is a consideration if you see them eating something dangerous and can induce vomiting before any clinical signs are present. This would help to prevent anything from being absorbed, for example when they are eating someone’s medication, eating rat poison or snail bait. One of the safer methods to cause vomiting is to roll a small ball of damp washing powder and dose this followed by some water. There is a risk of inflammation of the oesophagus, but this can be treated at the veterinarian. Do not use strong salt solutions, as this will cause vomiting but can cause salt toxicity, which causes neurological signs.